For seven years I’ve been reading Seth Godin. Seth does the 10 things successful people do (and more). Many years back he got me thinking about what it means to be remarkable. He actually wrote a book about it, and then wrote 16 more. If you are a regular follower, you know we have the “Remarkable Wednesdays” series where I have remarkable people come tell their stories. The series started to be a way to spotlight unsung women who are doing great things, living on purpose and helping to bring meaning to their work and lives. Then I had an unusual request… a guy from high school with whom I recently reconnected with last year at our 20 year reunion asked if he could write. Not just any guy, but the class clown….the guy who was anything but remarkable. I am an unconventional woman and usually go with what seem to be crazy ideas. I didn’t hesitate. I said yes. Why not? Live on the edge. Remarkable demands initiative. I figured I’d just see how things took shape. People change right? About the same time he offered, I received feedback from many of you that you wanted to get more of the male perspective on the topics we discuss: career, life, marriage, fitness, and balancing it all. Yep, I went against every principle I preach in this blog. I know. Terrible me for being a human being, huh? Remarkable is what Seth preaches! It’s what I preach. It’s who I am and striving to keep being. It’s what I hope you know you ARE! So why in the world would I shut this door on someone else? Why would I try to hold someone else back? This is the problem in the world. We need just give it our all and let it be. The good news is I saw the behavior and was able to stop myself. And so the result of that is Justin’s post is coming tomorrow. Crazy or not, he’s my first (and will be the only) “Remarkable Whoa-MAN” for Wednesday. We will kick off a series afterwards to bring in the male perspective. Everyone has a story but some aren’t ready to share it. And, some aren’t ready to hear it. Maybe this is you? I wasn’t sure I was ready to hear Justin’s or to share it with you. But I will. 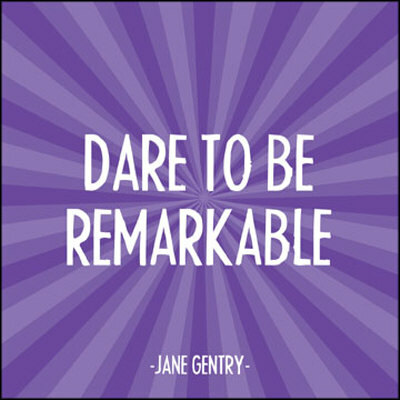 And, like the many who’ve written for this blog, I’m daring us to be remarkable.